The museum actively pursues the acquistion and restoration of historical aircraft. Our A-26 Invader sits on the apron before the beginning of our restoration project. Our F-84F Thunderbird sits on the apron before the beginning of our restoration project. Rear view of our F-84F Thunderbird as it sits on the apron before the beginning of our restoration project. Our MiG-21 is offloaded before the beginning of our restoration project. Our MiG-21 is moved into our restoration facility before the beginning of our restoration project. Right side nose and engine before restoration. Our Tupolev TU-2 before the beginning of our restoration project. Right side nose before restoration. 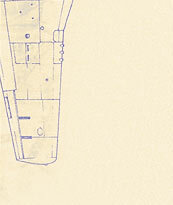 Right side fuselage before restoration. The beginning of our restoration project.